As we all know, a myth is a fictitious story that explains the existence of a natural phenomenon. 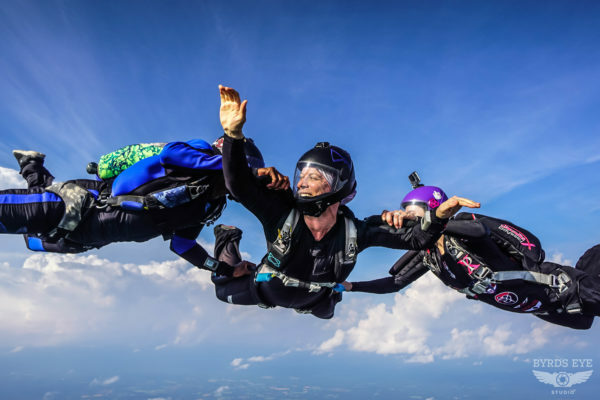 Since skydiving isn’t a mainstream sport, a lot of assumptions are built around it and many of them – well, there’s a lot of them and we’re here to help unveil the truths behind 4 skydiving myths. Let’s start with a little history. There have been many women before modern skydiving took hold that pioneered the sport such as, Tiny Broadwick. In 1908, Tiny made her first jump from a hot air balloon as part of an aerial act. She then made her first jump from a plane in 1913, making her the first woman to do so! She set the stage for many women after her. Many skydiving myths have stemmed from Hollywood so they can make scenes more engaging. Unfortunately, it’s left the general public with many misunderstandings about the sport. Talk in freefall like awesome scenes in Point Break or Cutaway? Nope! Falling at 120mph + creates a loud windy noise as the air rushes past your ears. Imagine driving your car side-by-side with someone trying to have a conversation. You might be able to hear babbling. Plus in freefall, you’ll dry your mouth out and spit all over your face while trying to talk while skydiving! In fact, we prefer full-face helmets so we can protect our faces, reduce the wind noise and avoid spitting in our own face! 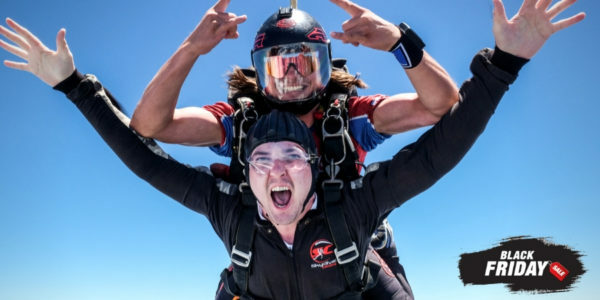 There are many variables that are unique to each individual that dictates the amount of time needed to invest in learning to skydive. We find that those that have practiced or mastered another sport(s) tend to pick up skydiving a bit quicker than those who have not. Another factor is time. To become a skydiver requires dedicating long amounts of time at the skydiving center for ground training, getting scheduled to jump, and post brief training. We encourage those who are dedicated in earning their license to plan on spending the day at the DZ and aiming to do 2-3 jumps a day. Jumping more in a day helps a person internalize and practice the information immediately and is a good foundation to progress. Ask almost any student and they’ll tell you that weather is another factor in how long it’ll take to earn your license. USPA and each skydiving center have their own safety precautions that are more strict for students. What does that mean? Weather. Weather plays a big role because if it is too windy (generally 14 mph or more), too cloudy, or raining, then there will be no jumping. What do we love most about skydiving? It does not discriminate! As long as you have the desire and meet the physical requirements, you can skydive! And that means no age limits. Skydiving is a very diverse and inclusive sport, and there are many clubs that embrace and encourage camaraderie of, well, older people in the sport such as POPS (People over Phorty Society), SOS (Skydivers of Sixty), JOS (Jumpers over Seventy), JOES (Jumpers of Eighty Society) and even JONS (Jumpers over Ninety Society)! How about you? Have you overcome a few myths and ready to try skydiving? Give us a call or click and we’re ready to welcome you to this great and growing sport!